To move from thinking behind the ball to doing over it, better players naturally develop what is known as a Mental Pre-shot Routine (MPR). For most, however, this transition is far from natural. To consistently play to your potential you must first develop your own MPR, and here’s how. Next time you play, stand several steps behind the ball and imagine a white line separating you and the ball. While behind that line, you may think, decide, calculate and analyze. Once your thinking is complete, make a commitment to your decision. No more thinking. No second guessing. Remain standing behind that imaginary white line and take one or two deep breaths; imagine the target or visualize the ball flight. If you like to take a practice swing, do so, but focus on the feeling of the swing – its rhythm, power or smoothness. Hold that picture and the feeling of the swing in your mind as you step over the white line, and settle in over the ball. Stay in this experiential space and hit the shot. Here’s the key – once you have stepped over that white line, if at any time your mind starts to question or doubt – i.e. you start to think – immediately go back and start all over again. This may be frustrating at first, but with repeated practice you will get really good at achieving a performance state over the ball. The best players in the world have the ability to move from thinking to doing – you can too. Doug Hodges developed his expertise as a Performance Coach while at the La Costa Resort in Carlsbad, CA. 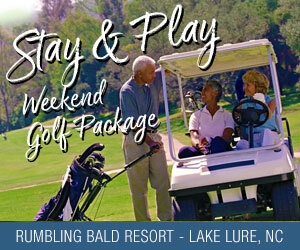 He now offers ThinkWorkPlay programs at the Heritage Golf Club in Wake Forest and The Grandover Resort in Greensboro. All golfers, from the Tour Player to Novice, now have the opportunity to develop the tools to unlock their potential, have more fun, and lower their scores. Visit www.thinkworkplay.com to learn more.